Centrifugation is the separation of mechanical mixtures on the integral part of the action of centrifugal force. The devices used for this purpose, called centrifuges. The main part of a centrifuge is mounted rotor with it a centrifuge buckets. The rotor rotates at a high speed, thus creating significant value of centrifugal force, under which there is a separation of mechanical mixtures, such as the deposition of suspended in a liquid particles. Centrifuges: 1 - manual: 2 - with electric drive. In clinical and sanitary-hygienic laboratories centrifugation used to separate the red blood cells from the blood plasma, blood clots from serum, solid particles from liquid urine, etc. are used For this purpose or manual centrifuges (Fig., 1), or centrifuges with electric drive, the speed of rotation can be adjusted (figure, 2). Ultracentrifuge, the rotor speed exceeding 40 000 rpm, usually applied in the experimental practice to separate the organelles of the cell, Department of colloid particles of macromolecules of polymers , etc. Centrifugation is the separation of coarse-dispersed systems consisting of liquid and solid components with different densities, using special devices called centrifuges. The principle of action of a centrifuge is based on creation of large centrifugal forces, under the influence of which the rate of separation of components of the mixture is placed in a centrifuge, increased many times compared with the speed of separation them under the action of gravity. Centrifuging method is widely used in biology, medicine and engineering, often replacing the processes of filtration, sedimentation and push-UPS. The centrifuge has a hull, gear, rotor, working (enclosing) the camera and the control panel. Some centrifuges are equipped with electrocase, providing automatic shutdown and braking in the range of 5 to 60 minutes Special centrifuges have refrigerators and vacuum unit with tracking devices and automatic control. The main part of any centrifuges - rotor (in laboratory centrifuges it is usually located on vertically installed a shaft of the electric motor or rotates through different transmission from the motor shaft, sometimes even manually). The centrifuge rotor is the drive (d-pad) with hinged seats for metal sleeves, which are tubes-makers at rotation in the horizontal position. Sometimes the rotor do in the form of a solid metal truncated cone cells for tubes (angle rotor); tubes in it are under constant angle to the axis of rotation (typically 40 degrees). At an angle tubes stripes mix components more quickly. The separation of the mixture is carried out in test tubes of different shapes and volume (Fig. 1). When operating at high speeds using tubes made of polyethylene, as glass burst. Located in the rotor against the other test tube with the processed material should be balanced. This is a uniform load on the shaft of the rotor and provided the uniform rotation of a shaft of a centrifuge. To balance tubes used special scales (Fig. 2). Fig. 5. Various laboratory centrifuges: 1 - clinical; 2 - table; 3 - small corner; 4 - stationary; 5 - refrigerated. Centrifuges used in industry, differ from laboratory more complex device rotor, allowing centrifuged a large amount of material at the same time or to separation processes continuously. Centrifuges with a small speed of the rotor are used in medicine for the Department of precipitation in urine, serum from blood clots, deposition of erythrocytes, serological studies etc. 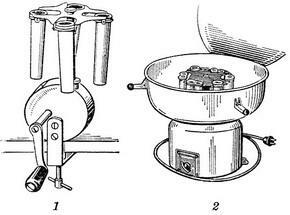 Microcentrifuge (Fig. 4) is driven manually; equipped with two interchangeable nozzles, one of which has a slot for micro test tubes and used to determine the compatibility of blood; the other with a slot for inserting graduated micropipette (hematocrit) - designed to determine the percentage of formed elements of blood. Centrifuges with great speed of rotation of the rotor in most cases equipped by replaceable rotors for different amounts of liquid, and are used for separation of finely dispersed suspensions. The centrifuge is equipped with elektrochelovek mechanism. Laboratory stationary centrifuge SSC-2 (Fig. 5, 4) has two removable rotor. The rotor-spider is equipped with four steel liners with a capacity of 500 ml and four glass vials to them with a capacity of 250 ml. Angle rotor with 8 polyethylene and steel tubes with a capacity of 50-75 Jr. Maximum rotors up to 6000 rpm Centrifuge is equipped with elektrochelovek mechanism. Among the special centrifuges refers laboratory refrigerated centrifuge CLR-1 (Fig. 5,5), intended for centrifugation at low temperatures (-5 degrees and above) various changing even at room temperature substances is mostly protein a suspension. The centrifuge has three replacement of the rotor, offering different modes of centrifugation. Two rotor identical but technical characteristics of centrifuge rotor type of SSC is-2, the third rotor, put on the extension axis develops 18 000-18 500 rpm Maximum amount of the investigational product -48 ml Centrifuge is equipped with elektrochelovek mechanism. Cooling of the working chamber is carried out with the help of the refrigerating machine.